Today, March 15, is known historically as the Ides of March. This is because, as legend has it, Julius Caesar was warned by a soothsayer to "beware the Ides of March." It was this day that Julius Caesar was stabbed 23 times by the entire Roman senate. To commemorate this day, it would seem most appropriate to talk about Shakespeare's Julius Caesar play. Interestingly enough, Julius Caesar (despite being the title of the play), is not the main character. In fact he only appears in three scenes and is killed in the beginning of the third act. The real central character of the play is Marcus Brutus, who was a great friend of Caesar but whom ultimately betrayed him. Many of Shakespeare's historical plays correlate with some sort of Elizabethan sentiment or topic of the time. In this case it is a clear reflection of the anxiety within England over the succession of the crown since Elizabeth had refused to name a successor which had people worried that England might break out into Civil War similar to the one in Rome, after her death. The play was most likely premiered in 1599. 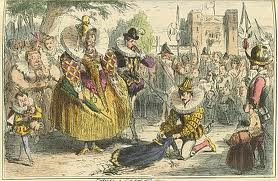 Good Queen Bess, The Virgin Queen, Belphoebe, Gloriana, these are many of the nicknames given to Elizabeth during her lifetime and she if often refered to by them even today. But what people may not realize is that Elizabeth not only received nicknames but also gave them to her favorite courtiers. Elizabeth called Robert Dudley, Earl of Leicester her "Eyes"
William Cecil was her "Spirit"
Robert Cecil was her "pigmy" or "elf"
Sir Christopher Hatton was her "mutton" or "lids"
Francis Walsingham was her "Moor"
Francis, Duke of Alencon, (her French suiter) her "frog"
The above couplet was written on the window in Elizabeth's jail/bedroom at Woodstock. She wrote on the window by engraving it with a diamond ring she was wearing. Elizabeth was questioned often about her feelings toward Mary, Catholicism, and whether Elizabeth had taken part in any of the plots against Mary. However, Elizabeth was always successful at indirectly answering questions and so Mary and her supporters were never able to find Elizabeth guilty of any wrongdoing. The one below was also written at Woodstock, but on a wall. Sir Thomas Gresham (1517/18–79) served as Elizabeth's chief financial adviser, negotiating loans on the Crown's behalf and advising Elizabeth on the necessity of recoinage. A very successful businessman, Gresham paid for the establishment of an exchange in London, the precursor to the London Stock Exchange, which was completed in 1569. After Elizabeth visited 1571 it became known as the Royal Exchange. The Exchange was very successful with merchants from England and Europe. It provided a valuable symbol of the nation's increasing wealth as well as of its changing status from an 'island nation' isolated from power to one that was a seat of power and commerce, independent of the problems in continental Europe. Gresham died suddenly, apparently of apoplexy, on 21 November 1579. His only son had predeceased him. From Saturday February 19 until Saturday February 26th I will be going on Progress. What is a Progress you ask? Well, during the spring and summer, accompanied by her court, Elizabeth toured southern England, the Midlands, and parts of the West Country, st aying with private and civic hosts, and at the universities of Oxford and Cambridge. The progresses provided hosts with unique opportunities to impress and influence the Queen, and became occasions for magnificent and ingenious entertainments and pageants, drawing on the skills of architects, artists, and craftsmen, as well as dramatic performances, formal orations, poetic recitations, parades, masques, dances, and bear baiting. The most expensive "honour" of all was that of housing Queen Elizabeth and her household. Elizabeth hit on the clever scheme of going on constant "progresses" about the country. Aside from the benefit of bringing her into closer contact with her subjects, she saved a great deal of money by making the nobles with whom she stayed foot the bill for her visit. Many nobles begged off the honour of her stay for fear of bankruptcy. My Progress is much less ornate, as I am only visiting family in California, but I'd like to think of it as an Elizabethan Progress!